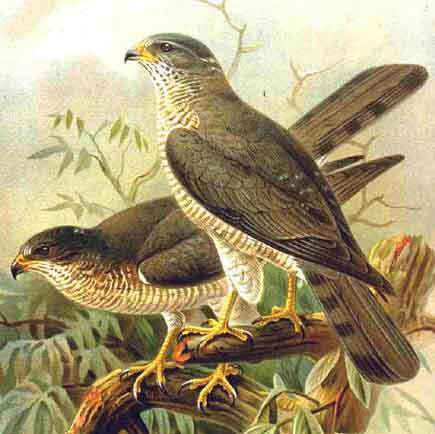 Levant Sparrowhawk is 30–37 cm long with a 63–76 cm wingspan. The female is larger than the male, but the difference is not as marked as with Eurasian Sparrowhawk. The adult male is blue-grey above, with dark wingtips, and barred reddish below. The adult female is slate-grey above with darkish wingtips. She is barred reddish brown below, and may show a dark throat line. The juvenile is dark brown above and has dark-streaked underparts. It shows a dark throat line. The flight of this hawk is a characteristic "flap – flap – glide". 1. ^ BirdLife International (2008). Accipiter brevipes. In: IUCN 2008. IUCN Red List of Threatened Species. Downloaded on 19 February 2009.